Register Log In GliderCENTRAL Forums Regulations & Laws Companion / Emotional Support animal state laws? 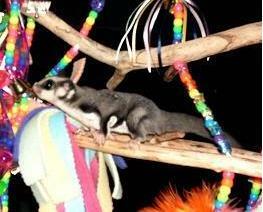 I've been thinking of getting my sugar gliders registered as companion animals, but I don't know how to go about it. I currently live in AZ - As far as I've read, I saw that someone in Washington state was able to successfully register their sugar gliders as companion animals. I was wondering if anyone has any info on how to do it in AZ, or if not, the states I could do that in or if there are any loopholes I could look into. I'd also like to know if this would allow me to bring them to states where they are illegal, to visit only/vacation, and if I would be able to travel with them on planes somehow, not in cargo but on board with me? I have a legitimate reason for emotional support, as I lost my baby a year ago due to a life-threatening ectopic pregnancy & my chances of having any children are slim to none after the incident. My little suggie boys have filled an emotional void in my life, and I take them with me everywhere I go. I would really love to have the freedom to go places with me, rather than hire a sitter. One of the 2 is so bonded to me that I feel he would be utterly devastated if I was gone for even 3-4 days. It may be harder than you think to get them certified as service animals. Good luck. Remember that God Loves You! "While I Breath, I Hope." Just so you know, it has been a while since she went through this, but a member here, alice33 tried to go through the same process so she could bring her gliders on the plane with her as she traveled. She jumped through a lot of hoops and the airlines still would not honor a service animal designation for sugar gliders. This is also VERY common in other situations because sugar gliders do not physically preform a task as is often necessary for legally autonomous service animals. Service animals are different than companion or emotional support animals. Under the ADA laws (Federal), a service animal can only be a dog or a miniture horse(yes, you could take your mini horse on a plane). But there are other laws in place that are more extensive/expansive. Public transportation (such as airlines) and public housing (such as rental houses/apartments and hotels) fall under different laws than just the ADA. Those laws help protect the rights of those that need/use emotional support animals. This document refines DOT's previous definition of service animal by making it clear that animals that assist persons with disabilities by providing emotional support qualify as service animals and ensuring that, in situations concerning emotional support animals, the authority of airline personnel to require documentation of the individual's disability and the medical necessity of the passenger traveling with the animal is understood. Judge not until you have walked in their shoes and lived their lives. What you see online is only part of the story. The soul would have no rainbow if the eyes had no tears. Here is a google list of different airlines and their policies on service animals including emotional support animals.